What is the volunteer visa USA? Many religious workers want to come to the United States temporarily for a variety of reasons. Workers cite as a reason performing missionary work or working in a religious organization to help the poor or needy. 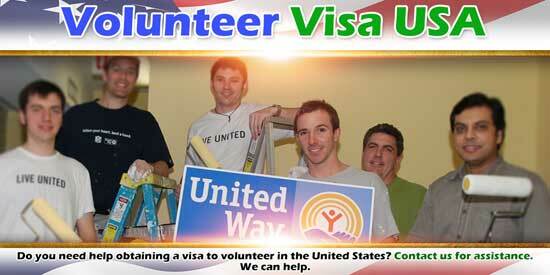 The volunteer visa USA is the way to get to the USA for your missionary or charitable work. This guide to the volunteer visa USA is part of guide to options available to religious organizations, and part of guide to US visa types. The B-1 business visa has evolved over time to encompass different activities. It started as a visa to permit noncompensated business activities. These activities include, negotiating a contract or visiting a trade fair. However, it evolved to cover a greater range of uncompenstated activity. We have a discussion of the B-1 visa as part of our guide to US visa types. But its ability to serve the volunteer is what we are emphasizing in this article. While not strictly a volunteer activity, the Department of State recognizes the B-1 visa as the appropriate visa for ministers. The visa allows taking part in an evangelical tour were offerings at each evangelical meeting provide support. Similarly, the visa allows ministers who exchange pulpits with a minister in the United States. These ministers continue to receive funds from the foreign church. Yet, they may use the B-1 visa to preach at the host church in the United States. Besides ministers, members of religious denominations, even if they are not ordained may receive the B-1 visa. They enter for the purpose of performing missionary work on behalf of the denomination. The only constraint is that these members do not sell anything nor solicit donations. Those with long memories, like me, will remember the rationale for this rule. Who can forget the wonderful experience of Moonies or Hare Krishnas? You were accosted at airports or on buses with a pitch to buy overpriced flowers or Moonie/Krishna publications. My guess is that the rule springs directly from the Moonies or Krishnas’ very irritating behavior. While missionaries cannot sell or solicit funds they may receive an allowance to reimburse the incidental expenses associated with the temporary stay in the United States. If applying under this category, it is important for the missionary to explain the nature of his or her work. Permissible work includes religious instruction, aid to the elderly or needy or evangelizing. No visa will issue for administrative work or work normally done as paid labor. One of the gifts by Department of State in this category is the recognition that the temporary stay may exceed the normal stay of six months in the United States. So a missionary with a plan of evangelism that takes over a year may disclose that plan and receive the B-1 visa. It is from the B-1’s use to facilitate voluntary service programs that the B-1 gets its name as volunteer visa USA. Now it is true that not all voluntary service programs are religious based, but this article will emphasize the use of this category to enable religious organizations and their members to get the volunteer visa USA. Here is a list of non-religious voluntary service programs. The applicant for the volunteer visa USA must show that they are participating in a voluntary service program benefiting US local communities. Furthermore, the applicant must show that they are members of and have a commitment to a religious organization. As with the use of the B-1 visa for missionaries, the volunteer may receive no salary or compensation in the United States from a US source. But, the volunteer missionary may receive an allowance or reimbursement for incidental expenses. To get the volunteer visa USA, the missionary or religious worker must show that the voluntary service program is an organized project conducted by a recognized religious organization to assist the poor or needy or to further a religious cause. As with the religious missionary category, volunteers may not sell items or solicit funds. The Moonies/Krishnas again. The Department of State has a long memory. When wishing to use the volunteer visa USA to enter the United States and take up the voluntary service program, it is not enough to simply have the visa in your passport. As a missionary wishing to come to work for the sponsoring organization, you must be able to present a letter at the port of entry to the Customs and Border Protection (CBP) officer. The letter, on organizational letterhead, should cover information about you such as your name and place of birth; your foreign permanent residence address; the name and address of your initial destination United States; and the anticipated duration of your assignment. Being able to present this information will make sure that CBP admits you to the United States in volunteer visa USA status. We help international religious organizations move their personnel around the world, and into the United States as they deem in the best interest of serving the advancement of their faith. This is an area in which we often provide pro bono or reduced fee immigration services. If you’re a qualifying religious organization and need help with the volunteer visa USA, our friend the B-1, please contact us.